When you gaze into the distance from Echo Point at Katoomba, the country you see beyond Mount Solitary is the Kanangra-Boyd Wilderness (c.73,000 hectares). 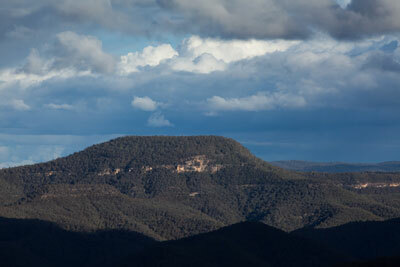 It takes in most of the wild bushland of the southern Blue Mountains, between Megalong Valley and the Bindook Highlands. The gazetted wilderness is globular in shape and roughly bounded in the north by rural lands in the Megalong, in the east by Lake Burragorang, in the south by the Oberon-Colong Stock Route (the road to Yerranderie) and in the west by Jenolan Caves, the Kanangra Walls Road and pine plantations. Well-known features include the Wild Dog Mountains, Coxs River, Kowmung River, Blue Breaks, Gangerang Range, Kanangra Walls and Boyd Plateau. 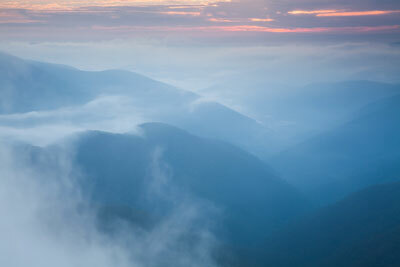 The wilderness covers parts of Blue Mountains National Park and most of Kanangra-Boyd National Park. As part of the Great Escarpment this is big country, with the greatest relief in the whole Blue Mountains: nearly 1200 metres from the Coxs River to the summit of Mount Guouogang on the Krungle Bungle Range. The drainage network of the Coxs and Kowmung Rivers are still carving back into the Central Tablelands where they rise beyond the national parks. 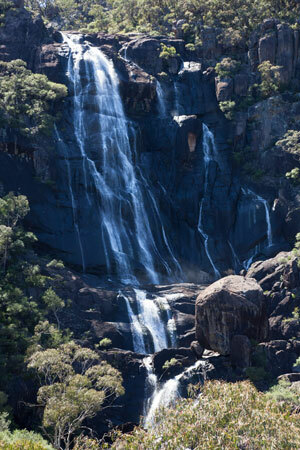 The spectacular result is a maze of ravines and ridges, with numerous big waterfalls running off the edge of the Boyd Plateau (a resistant outlier of the tablelands). 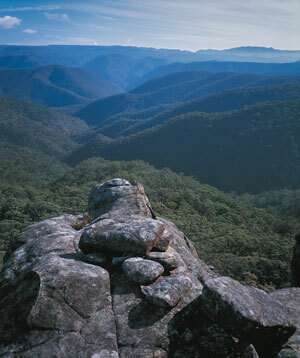 The dramatic scenery, coupled with ready road access from the north, west and east, has ensured the Kanangra-Boyd Wilderness has been popular with bushwalkers from the earliest days. Myles Dunphy and friends undertook several long expeditions in the early 1900s – adventures which prompted his activism for national parks. 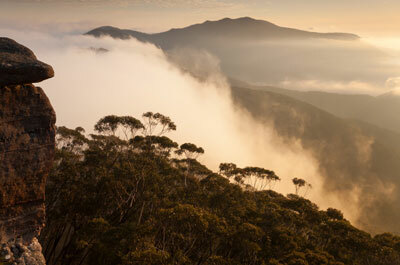 A classic but strenuous trip for modern walkers is the 3-4 day traverse from Kanangra to Katoomba. But long before bushwalkers appeared, and still, it is the homeland of Aboriginal people, particularly the Gundungurra, Dharawal and Wiradjuri. The area contains many sites of rock art and other evidence. An important Gundungurra creation story involves Mirrigan (tiger quoll) and Gurangatch (a rainbow serpent) battling it out and forming the landscape through the Wollondilly River, Coxs River and Jenolan Caves. Kanangra-Boyd is a much smaller wilderness than Wollemi, its sister area in the northern Blue Mountains, but is still the second largest in New South Wales. 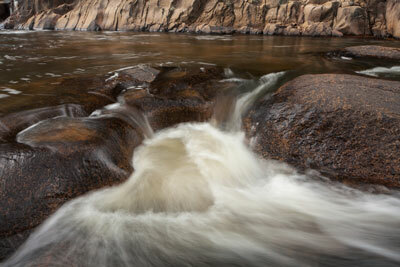 The Kowmung River is one of the largest Wild Rivers in NSW. 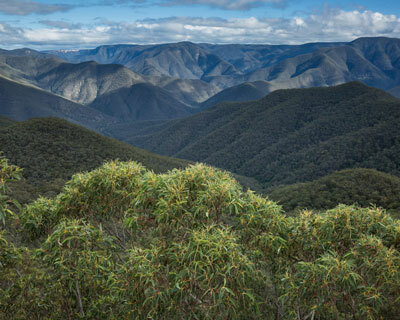 It is also far more diverse than Wollemi due to its altitude range and a great variety of geology, making it the most geo-diverse part of the Greater Blue Mountains World Heritage Area. Rocks over much of the area are from the Lachlan Fold Belt which forms the Central Tablelands: folded and partly-metamorphosed sediments of Silurian and Devonian age, including several belts of cavernous limestone. These basement rocks are intruded by Carboniferous-age granites in parts of the Boyd Plateau and upper Kowmung. Basalt lava remnants occur on the Boyd Plateau and on the landmark of Mount Colong, while pyroclastics and other volcanics form the Bindook Highlands and Yerranderie Peak. Horizontal layers of Permian-age Sydney Basin sediments survive on plateau areas like Kanangra Walls, Ti-Willa, Wild Dog Mountains and Bindook Highlands. The Blue Breaks are an extension of the Triassic sandstone plateaus of the central Blue Mountains, and extending into the Nattai Wilderness. The vegetation is similarly rich, but mostly comprised of a diversity of dry eucalypt forests and woodlands. 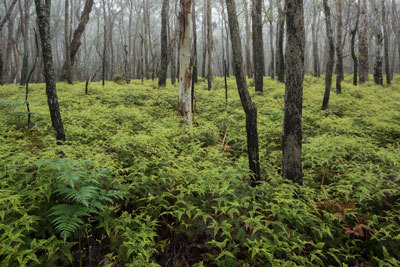 Heathlands, swamps, rainforests, riverine gallery forests, mallee and wet sclerophyll forests occupy smaller areas. Plant communities of note include subtropical rainforests with Red Cedar (Toona ciliata), deep in the valleys, magnificent wet heaths on the impeded-drainage flats of Kanangra Tops and thickets of a rare, blue-leaved wattle (Acacia clunies-rossiae) on the slopes of the Kowmung gorge. Relatively pure dingoes still roam the country, but sadly Brush-tailed Rock-wallabies only recently disappeared from their last local stand at Church Creek Caves (captive breeding is re-establishing a colony at Jenolan Caves, on the edge of the wilderness). Kanangra-Boyd has not always been a wilderness. Historically, much of the area was used for rough grazing, with a stock route traversing Boyd Plateau, Kanangra Tops and Gingra Range to the Burragorang Valley. Eucalypts were selectively logged on the Boyd Plateau and cedars in the gorges. Small-scale mining occurred on the fringes at Yerranderie and Mount Werong. It was the damming of the Warragamba River and flooding of the Burragorang Valley in the 1960s that ultimately ‘closed off’ the area from the east and allowed it to revert to protected catchment (Sydney’s most important) and wilderness. 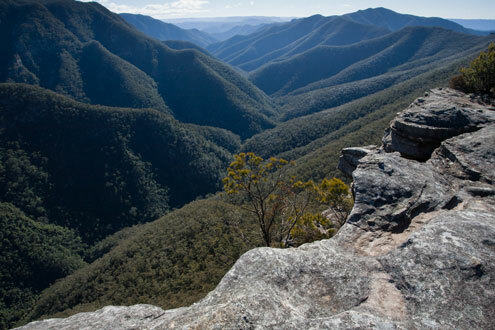 The view from Splendour Rock in the Wild Dog Mountains towards Kanangra and the Krungle Bungle Range is a bushwalkers’ favourite. Still, several new threats emerged even after that. A 1960s plan to mine limestone near Colong Caves was fended off in one of Australia’s seminal conservation campaigns. In the midst of a wide public campaign, activists bought shares in the mining company and disrupted shareholder meetings as far away as London. Then the Forestry Commission wanted to clear-fell much of the superb forests of the Boyd Plateau and plant introduced pines. This too was stopped – but the same fate befell large areas west of the upper Kowmung. Most recently, a plan to raise Warragamba Dam for ‘flood mitigation’ was knocked on the head by then Premier Bob Carr, because it would flood wilderness reaches of the lower Kowmung and other streams. An improved spillway was built instead, but the flooding plan was revived by the NSW Government in 2016 and remains an active threat as we enter 2018. It is instructive in these days of trying to convert everything into cash, to wander amongst the trees of the Boyd Plateau and ponder what might have been…or still could be. Other places the grandeur of Kanangra-Boyd Wilderness can be readily enjoyed is on the drive down into Jenolan Caves, from McMahons Lookout out of Wentworth Falls and from Burragorang Lookout near Oakdale (both of which look out to the Blue Breaks, now some of the remotest country in the Blue Mountains). But best of all is the sublime view from Kanangra Walls, which takes in so much of the diversity of this most accessible wilderness.